1. Make your book cases double as display cases. Whether you like a vintage look or prefer the symmetry of modern minimalist design, book shelves are a great place to display art work. Intersperse photo prints in ornate frames with books and natural objects like sea shells for a vintage or even gothic vibe. Use solid colored rectangular frames in different sizes to create a more modern arrangement. You can even take it one step further by hanging framed prints from the partitions or shelves of your book cases, transforming your book shelves from holders for books into stylish displays that show off your impeccable taste in both art and literature. 2. Hang it up poster style using binder clips. Maybe you have an unframed photograph and you don’t want to shell out for professional framing. You can still hang your artwork in a visually pleasing way without the frame. This super simple art hanging solution can still be elegant with a little forethought. Use copper (or rose gold colored) nails and binder clips for a visually pleasing and ultra minimalist art display. Keep the focus on the art work, while creating a casual, effortlessly cool vibe. 3. Build a DIY art mobile. 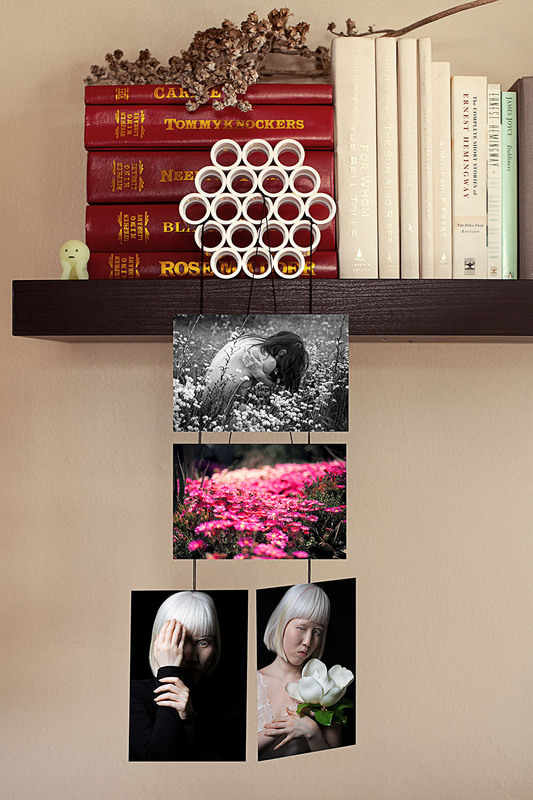 Add a personal touch to your room with a DIY art mobile. Art mobiles are an unobtrusive way to spice up your décor. You can hang them on the wall or from the ceiling. You can even rest them on a shelf, dresser, or table. For art mobile design ideas, hop over to Pinterest where you will find plenty of inspiration. You can use a piece of drift wood, metal, or even a simple wooden dowel. If you feel like getting creative, build your own base. Hang small prints from your mobile using string and a little strong yet easily removable tape (like painter’s or gaffer’s tape). 4. Create a wall art collage. If you have several complimentary pieces of artwork, you can arrange them together on the same wall to form a collage. This will work best if you have several prints that fit together in content and style. You can achieve this by purchasing several pieces in different sizes from the same artist or by gathering together a collection of artworks with a cohesive aesthetic and color scheme. Not sure what will make a good arrangement? Try tracing each piece onto lightweight paper like kraft or tracing paper. Cut the pieces out and use painter’s tape to temporarily adhere them to the wall. This allows you to try out different arrangements and choose the most visually appealing option. If you’re hanging portraits draw arrows on the paper to indicate which direction the subject is looking. Select a configuration which provides a sense of balance. Don’t want to worry about hanging at all? Just let it lean. For this option you will need photographs that are either framed, printed on stretched canvas, or mounted. Mounted prints are far less expensive than framed ones and you can even mount them yourself. Pre-cut mats can be purchased online or at your local art store. If you feel like taking on a small project, you can buy some matboard and cut it yourself. All you need is the matboard, a ruler, pencil, sharp blade or knife, and some adhesive to mount your print in a matter of minutes. Lean your artwork against a wall or the back of a chair. This will also work well on wall mounted shelves in any room in the house. Lean a few prints on the mantel or over your bathtub. This is the easiest, quickest way to display artwork!